Not many artists deserve comparison to Brian Wilson, but, if ever there was one, surely it’s Lindsey Buckingham. Both mean, after all, as undisputed pop geniuses, channeling their own eccentricities and tortured madness into wonderfully melodic, accessible, and creative music. And, of course, both men eventually succumbed to the pressures of their own demanding muses; Wilson notoriously broke down during the middle of his Smile album, crumbling under the weight of his own creative ambition, while Buckingham, after playing a central role in one of the most wildly popular blockbuster albums of all time, Fleetwood Mac’s Rumors, turned to spearheading one of the most dumbfounding and bizarre albums of all time, the indulgent and drug-addled Tusk, eventually fading away into a solo career that’s been deafeningly quiet and frustratingly sporadic, especially after his proliferation and chart-topping success with the Mac. But both men, of course, have more or less recovered. Wilson eventually finished the Smile album to rave reviews, and Buckingham’s recent output has been marked by a genuine sense of peace and serenity, as he’s seemingly abandoned the excesses of his rock and roll youth and settled into a life of quite pleasure and simplicity with his family and his art. For all these superficial similarities, however, the standing differences between the two could not be more pronounced than they were in 2008, when Wilson released That Lucky Old Sun, a deliberately nostalgic, backwards-glancing pop album, and Buckingham turned out Gift of Screws, an album that’s very much about the here and the now. Which doesn’t mean, of course, that it finds the artist charting new territory, but it does find him taking stock of his gifts in a way that makes this easily his most essential and consistent record as a solo artist. Indeed, for the first time, all of Buckingham’s gifts are on display on a single album– the guitar pyrotechnics, the sun-kissed California pop melodies, the strange flourishes of studio wankery, the deeply sentimental lyrics. Even more impressive: He accomplishes all of that in an endearingly short, concise set, as the album clocks in at just ten songs and less than 40 minutes of music. Of course, most of that can also be said of his 2006 album, Under the Skin, a quietly introspective, inwardly focused disc of acoustic singer/songwriter fare. Gift of Screws has been heralded as his turn away from introspection and back toward all-out rock, which is partially true but also a bit misleading. For one thing, Buckingham proves here that pop and rock can be just as introspective as acoustic folk, as these songs form a very personal and intimately-detailed reflection on the cost of celebrity and the rewards of love and family. And while it’s true that the album occasionally erupts into the kind of white-hot electric guitar solos he generally reserves for his live shows, to call this his rock album is simply an oversimplification, as it’s really a pop album that happens to rock from time to time, but also covers a lot of other ground. Indeed, it encompasses everything he’s ever done, and seems to point toward the future even as it takes stock of the past. It’s a bravura performance, one in which Buckingham revels in all of his many skills. Those who love him for his studio wizardry will get a kick out of the wicked-cool opening track, “Great Day,” a seamless blending of muffled percussion, kitschy keyboards, spry acoustic fingerpicking, distorted vocals, and a pair of raging electric guitar solos; he’s practically a one-man symphony. Those who are still under the spell of Under the Skin will appreciate the nimble acoustic guitar work of “Time Precious Time,” while those still holding out for a Fleetwood Mac reunion won’t want to miss “Did You Miss Me,” a ridiculously catchy pop track that would have been a standout even on Rumors. But of course, there practically are a couple of Fleetwood Mac reunions here, as Mick Fleetwood and John McVie stop by to provide the rhythm tracks to a few songs, even bringing a blues touch to the winding “Wait for You”– a road down which Buckingham proves more than happy to go with his swaggering electric guitar licks. The rest of the album offers variations on this sound, from the artsy studio craft on “Love Runs Deeper” to the slamming rock of the title cut. It all culminates in a wonderfully gospel-drenched closing number, “Treason,” a song that’s about as hooky and addictive as anything he’s ever written. Buckingham sounds like he’s having a blast here, which is half the fun; it’s a joy to hear an artist of his stature so contented, so pleased just to be making music. He sings about his love for his family and the quiet life here– sometimes with joy for the present, elsewhere with regret over past mistakes– and it’s hard not to think of this as the sound of lessons learned, wisdom gained. And indeed, Buckingham sounds like he’s in a good place right now; while many of his peers, like Peter Gabriel or Phil Collins, either grow increasingly insular and indulgent or keep hashing out the same old tripe, Buckingham is a rare artist who continues to push himself without ever turning his music into pure vanity. 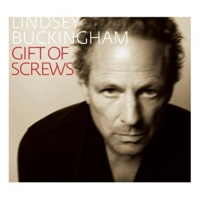 Gift of Screws may be a very personal project, but it’s almost as fun to listen to as it must have been to make, and that, as much as anything, is what makes it a standout in a career that’s been full of them.